Time to reach for the Stars! Just like the universe, we’re expanding. It’s time for you to skyrocket your success. When you’re going on a voyage, you want to go with someone with a proven track record. We imagine you don’t want to chase just any pipe dream. You want a star that is going somewhere. No doubt, you want someone who can show you what they are made of. We get that, we want that too. Loyal: Owned and operated by the same two co-founders. Established: NorthStar Moving has been in business over 20 years. Founded in 1994. Hard working: Built the company from nothing. Dedicated to happiness: Multiple Best Places to Work awards. Growing: Multiple awards for Fastest Growing Company on local level. Driven: NorthStar Moving moves approximately 8,000 clients a year. Really growing: Multiple awards for Fastest Growing Company on a national level. Actually caring: Involved in the community and have received awards for our commitment. In Love with our planet: Treehugger! Awards for Green Practices & featured in college text books for our green practices. In Love with our clients: Moved everyone from Angelina Jolie, basketball great Derek Fisher, and the Jonas Brothers, to The Getty Museum. Glowing reviews and extremely happy repeat clients. On a mission: To exceed our clients’ expectations and move service back to what should have always been the ultimate service industry: the moving industry. Needed: People move a lot. 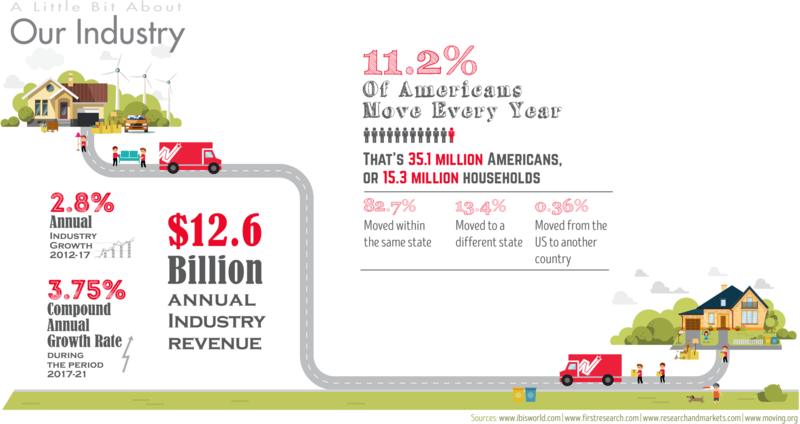 Last year 35,100,000 Americans moved. That’s an overall percentage of 11.2 percent annually. Looking for you: California is our home base. Let’s conquer the rest of the country. It’s always a little embarrassing to talk about how great you are, you end up sounding like you’re making stuff up. So, let’s just talk facts. Let’s allow NorthStar Moving’s record to speak for itself. We tell our clients not to take our word for it when they choose a mover, and we want you to be skeptical too. Do your research. Look us up on Yelp and social media sites, take a look at NorthStar Moving’s website. See what our clients say, look at the awards, look at the commitment to the community and to keeping the planet green. We are at the beginning of another journey. We’re expanding. We want Franchisees who share our commitment to client service, the community and to their team members. Because, we are just starting on this phase of our journey, there is a huge opportunity for you to choose your ideal location. We have a very strong presence in California and amazingly enough we have a very strong national reputation; thanks to the amazing press we’ve gotten in publications like: Vanity Fair, Fortune Small Business, NBC National News, Robb Report, Real Simple Magazine, Inc Magazine, etc. What most people don’t know is that people move a lot. We mean a lot. And when you do a great job for someone you move, they become your best ambassadors. They tell their friends, family and co-workers. You don’t need to advertise. They do it for you! Why? Because moving is stressful. Really stressful. They appreciate that you’re taking the time to make a stressful situation into a smooth one. They remember a job well done. They remember who got them safely into the next part of their journey. Want to find out if you want to go on this journey?